RSheiffele@aol.com Norwalk, CA - - A capacity crowd, hungry for drum corps, filled Cerritos College Stadium for the first West Coast DCI show of the season. The Southern California Classic, sponsored by Impulse, had all three DCI Divisions in competition, including a debut field performance by the SoCal Dream senior corps. Opening night jitters were apparent, but unlike in previous years, it was promising to see that all corps had completed their shows from start to finish. Taking home first place with a score of 74.90 were the Blue Devils. This year's show, titled "The Phenomenon of Cool," is probably one of the best-designed shows the Blue Devils have fielded in recent years with every section completely and beautifully integrated amongst each other. In fact, all sections, including the guard, engage in some very cool vocalization that had the crowd hooting for more. Age-out guard member Beta Aminabagi, 21, of Fresno, Calif., said she was "fighting feelings that, oh my God this my last 'first show' with the Blue Devils ever - - you get that feeling and you think you're going to be really nervous but I tried to get it together because that's when crazy things start happening." Beta went on to say that "the color guard really connected - - this is a really special color guard, and I know that people say that every year, but everyone works really hard and everyone actually gets along, and that really helps us on the field come together and have good performances. Aminabagi, who recently graduated from the University of California -- Berkeley with a degree in sociology, is one of several Blue Devils members keeping "life on the road" diaries that are posted on the Blue Devils' Web site. Marimba pit member Shannon Hensley, 20, of San Jose, Calif., is also keeping a diary and says that "so far it's been pretty cool - - I've already received e-mails from people who've read my diary who are interested in what we do, so that's really exciting to talk to fans." When asked about her first show of the season, Hensley said that is was "very exciting and very nerve-wracking, because there are still some parts of the show that are a little hairy, but we really pushed through those, and I think it came out as a really awesome show to the crowd." Hensley was quick to point out that the show is still evolving: "We were already working on changes today during our rehearsal block that won't be put in until later in the week ... it's (the show) is constantly changing." Taking home second place was the Santa Clara Vanguard with a score of 71.90. Their show, "Pathways," is a visual labyrinth that starts out with a signature image of the horn and drum lines 100 yards apart on the field. In reaction to their season debut, mellophone player Julio Sandoval, 20, of Vasalia, Calif., said that there was "definitely a lot of energy coming out from all members of our corps, and we were just trying to put out a good performance to make a good impression on our audience. Sandoval said that the corps had their first uniform run-through on Thursday night, and that the closer still has "its shaky moments with horn line and drum line placement on the field." Sandoval, who has been with the Vanguard organization since 1999, is excited about the summer tour and in particular, Orlando championships, because both his brothers (Jamie and Ed) aged out with Vanguard in Orlando in 1996 and 1997 respectively -- "definitely a lot of family tradition there." Seated third for the evening were the much-improved Denver Blue Knights with a score of 65.70. Their 2003 show, "Primary Colors," moved beautifully across the field. All sections -- in particular the percussion -- appeared quite strong for the early season and it was very clear that the Blue Knights could be poised to re-enter DCI's elite top 12 this year. Baritone player Adam Brooks, 21, of Gainesville, Texas, said that for the first show of the season "We were pretty pumped, it was a good show. We've been working really hard and I think it paid off - - we had a lot of fun on the field." 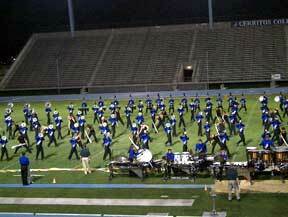 In terms of movement, the Blue Knights were on par with the Blue Devils. Brooks, who's a student at Texas A&M, said that the entire corps focuses on dance technique and that part of their "basics" is dance training: "During the show, it's like were flying or gliding across the field rather than marching. That's part of the intrigue of the Blue Knights for me - - that it's more of a graceful flow to the drill as opposed to hoofing your feet to the music." In fourth place was the Pacific Crest with a score of 63.85. Their show, "Invocaciones a Poderosos," is sure to be a contender for a finals night slot in Orlando. In reaction to their season bow, marching coordinator Walt Omiecinski said, "We're very excited, because although there are still areas that need improvement, we have a full season to go ahead and make those improvements." Omiecinski also went on to say that there's a new ending to the show coming in three weeks with a lot more characterization. Pacific Crest, which has traveled only throughout the west coast, will be making their first DCI Championship Week appearance in Orlando this year. Omiecinski said that Pacific Crest is "really excited that Southern California's secret won't be a secret anymore."